TVA has again made Site Selection magazine’s list of power companies that do the best job of economic development. Knoxville-based Tennessee Valley Authority is one of ten utility companies included on the annual “Top Utilities in Economic Development” list published in the magazine’s September 2013 issue. Site Selection magazine is closely followed by thousands of corporate executives across the country who decide where their companies will invest in new plants and expand existing ones. TVA has made the magazine’s list each of the last several years. Given its mammoth service area it’s not surprising that TVA is a major player in the regional economy and it often lands on rankings like this. Still, recognition from Site Selection is a lot better than not making the list at all. The list is based on an “analysis of corporate end-user project activity in 2012 in that company’s territory; website tools and data; innovative programs and incentives for business, including energy efficiency and renewable energy programs; and the utility’s own job-creating infrastructure and facility investment trends,” the magazine said. The power companies are listed in alphabetical order. Click here for the Site Selection story. This entry was posted in TVA and tagged econmic devlopment, energy, Renewable energy, Site Selection, Tennessee Valley Authority, TVA on September 3, 2013 by Roger Harris. The Tennessee Valley Authority has again been named to Site Selection magazine’s annual list of the top utilities in economic development. 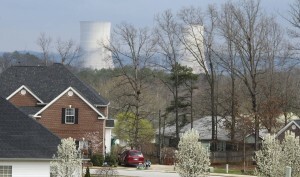 TVA is one of ten power companies on the 2012 list. Another ten companies received honorable mention. This entry was posted in Site Selection, TVA and tagged ash spill, energy, Energy efficiency, incentives, Jobs, nuclear, power companies, site consultants, Site Selection magazine, Tennessee Valley Authority, TVA, utilities on September 5, 2012 by Roger Harris. TVA is proposing to do a power transmission improvement project in Bells, Tenn. and will hold a public meeting July 22 to give details and allow people a chance to sound off. TVA proposes to upgrade the Gibson Electric Membership Corp. Bells Substation from 69 kilovolts to 161 kilovolts and build about six miles of upgraded transmission line between TVA’s Alamo Substation and the Bells Substation to handle the extra load. This entry was posted in TVA and tagged Crockett County, TVA on July 12, 2010 by Roger Harris. It’s not there yet, but summer temperatures in the upper 90s are pushing demand for TVA electricity close to its all-time highest recorded power demand. On the afternoon of June 22, TVA met a demand of more than 30,000 megawatts, which compares to the all-time high demand of 33,382 megawatts TVA provided on Aug. 16, 2007, when temperatures in East Tennessee averaged 102 degrees. The Tennessee Valley Authority, which provides electrical power for 9 million customers in seven Southeastern states, has a capacity of 36,000 megawatts of available power. This entry was posted in TVA and tagged power demand, summer temperatures, TVA on July 9, 2010 by Roger Harris. College students participating in TVA’s Investment Challenge Program produced some eye-popping returns in 2009. Lipscomb University was the top-performing school with a 62.29 percent return, TVA announced earlier this week. Western Kentucky University and East Tennessee State University were second and third, with returns of 45.62 percent and 43.83 percent, respectively. Students at 24 area universities in TVA’s service area that participate in the program manage a piece of TVA’s stock portfolio, producing real gains and losses. This entry was posted in TVA and tagged college students, Investment Challenge Program, portfolio, returns, stock, TVA on June 9, 2010 by Roger Harris.